"The Value of the Moon: How to Explore, Live and Prosper in Space Using the Moon's Resources." Should NASA, along with other spacefaring nations and private companies, try to establish a continuous human presence on the moon? Should the moon take priority over a human mission to Mars? In his new book, "The Value of the Moon: How to Explore, Live and Prosper in Space Using the Moon's Resources," (Smithsonian Books, 2016), planetary scientist and author Paul D. Spudis explains why the moon could be a critical stepping stone for robotic and human missions to other solar system destinations. Following in the footsteps of people like aerospace engineer Wernher von Braun and science-fiction writer Arthur C. Clarke, Spudis uses recent lunar science to show that the moon contains the resources humans need to make it a space-based fueling station and production facility for solar system travel. Space.com: Can you give me a brief overview of your new book? Paul D. Spudis: It's kind of a combination of three different things. I wanted to write a history of the United States' interest in the moon — our voyage there with Apollo, but also our attempts to return there after Apollo. So it's a history in that sense. Paul D. Spudis is a planetary scientist and author of seven books about the moon. It's [also] a memoir in that I've been doing this for the last 30 years, [and] I wanted to tell some stories and give some perspectives that I had not seen in other accounts. So I'm giving people my insider's view of what happened and why it happened. And then, the last part is that it's an advocacy document. It's a brief on why I think it's important to make the moon a destination. So I tried to combine those three elements into one continuous narrative. Space.com: People may have heard about possible plans to return humans to the moon. What's the argument you make in the book for why humans should return to the moon and establish a presence there? 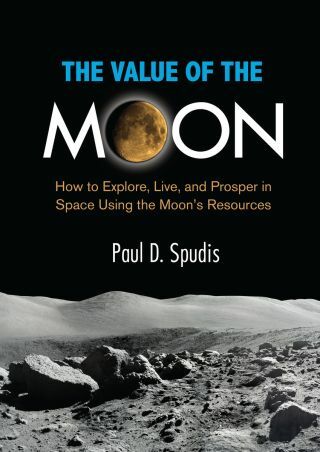 Spudis: The argument of the book is that, fundamentally, the moon has value because it has what we need to create a permanent system of space transportation. And that requires a little bit of explanation, but what it means, basically, is we can use the resources that are found at the poles of the moon. [The resources] come in two forms: There's the frozen water that occurs in the cold, permanently dark areas, and then there's the quasi-permanent sunlight at the peaks around both poles. So you have continuous energy [from the quasi-permanent sunlight], and you have [water], which is probably one of the most useful things you can find in space. As a material, water is extremely useful. You can use it to support human life. Obviously, you can drink it. You can use it to reconstitute food. You can use it for sanitation. You can use it as radiation shielding. So it's a consumable that helps protect and sustain human life. You can use water as a medium for energy storage. When you have the sun shining, you can pass an electrical current through the water and break it down into its component gases — hydrogen and oxygen — store those, and then when you're in an eclipse or at nighttime, you can combine those two gases in a fuel cell to generate electricity. So it's a completely reversible process, changing water into gases and then from gases back into water. So it's a medium of energy storage in that sense. And finally, and most importantly, the last use of water is that when it's broken down into its component gases and then cryogenically frozen into liquid form, it's the most powerful chemical rocket propellant we know of. So what does that mean about the moon? What does that tell you about the value of the moon in terms of spacefaring? What it means is, we have an offshore fueling station right next door to the Earth. We can use the resources of the moon to create a fueling system and a logistics depot that can support long-duration spaceflight not only between Earth and the moon, but to the planets as well. Space.com: So, in your most realistic but also optimistic projections, what does the human presence on the moon look like in 50 or 60 years? Spudis: So, what I propose is, in 50 or 60 years, what we see are bases that are at the poles of the moon, that are harvesting — that are digging up and collecting — the frozen water there, storing it and using it for the variety of purposes that I've talked about, but [also] using that to provision a system of transportation elements. These are landers that go back and forth between the moon and orbit, from the moon's orbit back to the Earth's orbit, and beyond to the planets as well, using the lunar propellant and lunar consumables to provision those kinds of missions. So you're going to the moon to create a permanent, continuously operating spacefaring system. Space.com: In your book, you talk about a lot of things that go beyond just the science, and you discuss what you think should be done — and can be done — in the realm of human spaceflight. Spudis: Yes, this goes beyond science, and into engineering. But I think this is a case where our scientific knowledge is actually acting in service to our ability to create spaceflight capability. A lot of people say, "What's our goal? Is it to go back to the moon or to Mars, or which?" Well, my goal is everything in the solar system. There are many places where you can envision missions, some of which may need people, some of which you just need robotics. But in any of that, you need the ability to send large, power-rich probes and machines to these places in order to do the kinds of things we want to do. Now we can't always do that by launching stuff from the surface of the Earth. There just aren't enough big rockets; there isn't enough money in the economies to support that kind of effort. Because you're lifting enormous amounts of mass out of the deep gravity well of the Earth. [Editor's note: When discussing a rocket's struggle to get away from a massive body, it is sometimes said that the rocket must climb out of the object's "gravity well." The stronger the gravity, the "deeper" the well.] In the inner solar system, Earth has the deepest gravity well. But the gravity well on the moon is only one-sixth of the Earth's. It's much easier to lift the "dumb mass" — the consumables, the water and the rocket propellant — from the moon than it is to do that from the Earth. So that's the argument for going to the moon. And yes, you're right — it's not a scientific argument, per se. It's a case where science is being applied to the task of creating a spacefaring capability. That's the way I like to look at it. Space.com: How did you gather the engineering information and the spaceflight information for the book? Spudis: This is nothing I came up with. People have been thinking along these lines for a long time. If you read the early writings of Wernher von Braun, back in the '50s, he wrote a book called "Across the Space Frontier." And he talked about the various steps of moving humanity into space. And Arthur C. Clarke is another example, another early writer in the '40s and the '50s. And all of them envisioned going to the moon and using the resources of the moon to fuel rockets and to make air and to make water so that people would be able to live in these places. So that's been kind of a dream for a long time. What is new is that we didn't know until fairly recently that the materials that we need to do that actually do exist [on the moon]. And they do actually exist in quantities large enough to make this feasible. So I've been interested, for a long time, in spaceflight in general. I've always wanted to live in a world where we could go where we want, when we want, to whatever mission we could envision. And to do all that using rockets [only] launched from Earth is so incredibly difficult and so incredibly expensive that it's very likely we will only do a fraction of the things that we could imagine doing. So what I want to do is change that template — to change it from being limited by what my friend Don Pettit, the astronaut, calls "the tyranny of the rocket equation." The rocket equation basically says the bulk of the mass of a rocket is devoted to fuel and tankage, and not to payload. But we can change that by getting our fuel from sources that are already in space. And that's really the argument. It's not a new dream; it's just that now, for the first time, we actually know that it's possible to realize that dream. Space: There's also the argument that the moon could be a training ground or proving ground for a human mission to Mars. Can you talk a little bit about that? Spudis: You can use the moon as a proving ground simply because there are many things … that you'll do on any planetary or lunar mission that you can rehearse, practice and perfect by going to the moon. So, for example, we talk about extracting water from the polar ice of the moon. Well, people say, "Well, that doesn't really apply to what you might do on Mars." Well, actually, it does — because there's ground ice on Mars as well. And in both cases, it involves a similar sequence of activities: You dig up the frozen ground or the ground ice, you melt it or you heat it up to extract the water, you collect the vapor, and you store the product. And you have to handle granular materials at each stage. Now those processes are common to the moon and to Mars both. So by doing that on the moon, you've already established a technology base, a set of procedures and equipment. You've learned what not to do and how to be careful and do only those things that contribute to a successful extraction. And at the same time, you've also tested the machines that you can use on Mars in an environment that closely simulates it. So, it's true that they're two different [worlds], and they have different environments, and they have different histories. But at the same time, there's a lot of commonality. They're both terrestrial, rocky objects. They both have dusty surfaces; they have alien, hard radiation near-vacuum environments from which people have to be protected. They have extremes of temperature, both in terms of cold and heat. And you need to basically adjust your machines and your procedures to those conditions. So, in that sense, the moon is a good proving and testing ground for the kinds of things you're going to be doing later on Mars. Space.com: It seems like the discussion about NASA's future space plans has come to a fork in the road — the agency can choose the moon or Mars. And it seems like that decision will have to be made soon. Do you agree? Is that the decision NASA needs to make now? Spudis: Well, the reason it's a decision — or the reason it's being treated as a decision — is that it's assumed that we can't do both. It's assumed there is going to be a limited amount of resources and, therefore, a decision has to be made about what should get the main emphasis, simply because we don't have enough money to do everything. I would argue that, in that kind of calculus, you want to ask yourself the question, "What is your long-term goal? What are you really trying to get out of human spaceflight?" We've asked that several times over the years. Different people have come up with different answers. I think the answer to that question is what I mentioned earlier: What we really want is the ability to be spacefaring, to be able to go where we want, when we want, to do a variety of different kinds of jobs. So my argument would be that to do that, you need to develop a permanent space-based system — a system that will be robust enough to allow you to do a wide variety of different things but also allow you to do them repeatedly. You don't want a system that just works once and then you throw it away. So [from] that perspective, the question [should we go to the moon or to Mars?] really doesn't come up — because, of course, the moon is in the critical path, because in order to go to Mars, you need to create a system that will allow you to go to Mars and any other space destination repeatedly and not just once. An image of the lunar surface captured by astronauts during NASA's Apollo 15 mission in 1971. The problem is, if you decide to make Mars the only goal, in the same sense that the moon was the only goal during the 1960s, during the Apollo program, when you run the risk of making the Mars program the next Apollo program. You will go there, you'll plant the flag and then no one will go back for 50 years. I don't think [people advocating Mars travel] want that. I don't want that. What I want is a system that allows you go to continuously to all the interesting places that the solar system has to offer. And I think using the moon will allow us to do that. Space.com: I hear a lot of people talk about how they wish NASA could do what it did during the Apollo program, and that the United States should get back to that. Do you hear that a lot, and do you think it's a good idea to think about near-future spaceflight plans as a way to get back to the Apollo days? Spudis: I don't think it's a useful way to think about the problem. The fact of the matter is, Apollo was not about spaceflight. It was not about space at all. It was about beating the Russians to the moon. … Fundamentally, Apollo was a battle in the Cold War. We challenged the Soviet Union in a race to the moon. "We're going to go to the moon, and we're going to put a man on the moon by the end of this decade." That's what Kennedy said. Well, why a man on the moon, and why a decade? Well, obviously, he was challenging the Soviet Union, saying, "We have the technology and the wherewithal to do this, and you don't." That was sort of the unspoken statement. So [it was] a battle in the Cold War, and what happens when you win a battle? You don't keep fighting it. When you win a battle, you've won the victory; you don't do it anymore. So, in effect, the predicate, the assumption behind the Apollo program, contained within it the seeds of its own demise. Because once you achieve the goal, there's no need to continue achieving it again and again and again. So that's why Apollo ended. And, in fact, after Apollo, the original plan was to build the [space] shuttle not as an end-all program but as the first step of a continuously expanding process out to the moon and to the planets beyond. So the original "von Braunian" paradigm was: shuttle, space station, moon tug, Mars mission. So you would incrementally build each step, which would allow you to take the next step. So, first, you'd have a shuttle from low Earth orbit to the orbiting space station. And then, from the space station, you'd have a moon tug to take you to lunar orbit. Then, you'd have a lander to take you down to the lunar surface; then, you would have a Mars craft built in space that would go to each of the planets. So each step enabled the next step. It was an incremental, step-wise process. That's sort of the template we're trying to return to now. And what we've found recently with lunar exploration is that we can use what we've found on the moon to actually help fuel and provision this system. So I don't pine for the days of the Apollo [missions]. I loved those days; I watched every mission on TV. I even recorded the audio, the air to ground [communications]. I have those little tapes, believe it or not! And I still enjoy listening to them. I mean, it was a great time. It inspired me, and it inspired a lot of my colleagues in the same way. But at the same time, I recognize that it was a historical anomaly. And it doesn't necessarily give us the path with which to pursue a future space program. So the answer is yes, Apollo was great; yes, Apollo was glorious; no, it is not the way to approach future human exploration. This interview was edited and shortened for brevity and clarity. Go here to read an excerpt from Spudis' book.